I’ve had a few ankle sprains come in this week for assessment and treatment. When assessing sprained ankles, a potential injury that is important not to miss, is the “high” ankle sprain, or syndesmosis injury. The syndesmosis is the connection between the two parallel long bones in the lower leg (the tibia and fibula). The two bones are joined by ligaments at the bottom, and a membrane along their length. The syndesmosis is commonly injured with a twisting mechanism, with the foot caught on the ground when a second player falls across the lower leg. The foot is essentially wedged between the tibia and fibula, separating the two long bones, damaging the ligaments and the membrane. It is always painful and difficult to walk on, however there is usually less swelling than a standard ankle sprain. There is also commonly a degree of injury to other ligaments of the ankle, which can be the first thing we notice, at the risk of missing the syndesmosis injury. It is important not to miss these high ankle sprains because if there is a resulting instability in the ligaments, the extra movement causes long-term pain, and potentially, future arthritic changes in the joint. Clinical testing is good at detecting a syndesmotic injury. Clinical testing is then followed up with weight-bearing x-rays of both legs to compare the degree of ligament laxity and resulting separation of the long bones. An MRI confirms the degree of injury and whether the ligaments have ruptured. 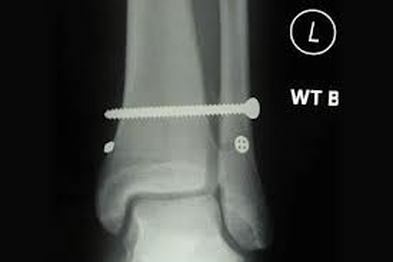 An unstable syndesmosis injury requires surgical repair with a screw or tightrope to hold the tibia and fibula together. There is a period of 6 weeks not putting weight on the ankle, and around 12 weeks before return to sport. The screw is later removed. A stable syndesmosis is treated conservatively with physiotherapy; keeping in mind full return to sport takes longer than a usual ankle sprain. In summary, it is worth getting all ankle injuries assessed to make sure a more serious syndesmosis injury isn’t missed.